More Web rings for you to travel through, sorry that they are in two pages, I thought it would load faster if I split them up! You will definitely enjoy surfin' around in all these web rings! Back to first webrings. This *N SYNC - Crazy for You! site owned by Donna. To join this Web Ring, click here. 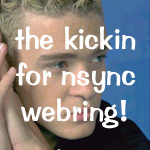 Want to join Giddy Up With *NSync Webring? 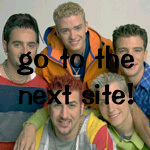 Want to join "Stay Nsync" the webring? You may also check out a list of All The Sites In The Ring.